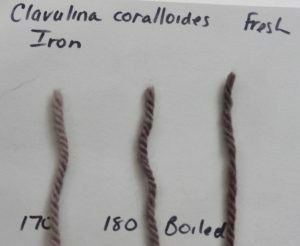 I’m actually making some headway on my crocheted silk wrap, all in mushroom colours, that must be finished by October in time for the Fungi & Fibre Symposium—once I got into the pattern, I discovered it was much easier to follow the chart instead of the written instructions, and now I can see where it’s taking me. This is the back. I’ve also blocked matching side pieces and am now attaching all three sections in such a way as to make openings where I’ll add the sleeves. I’m following the pattern on faith here in the belief that eventually this too will make sense. The mushrooms are appearing early this year, thanks to a glorious rainy spring and early summer. I hope to squeeze in some dyepot time in the next few weeks, but with three months to go until the big event, my priorities are elsewhere for the most part. Now this is strange . . . 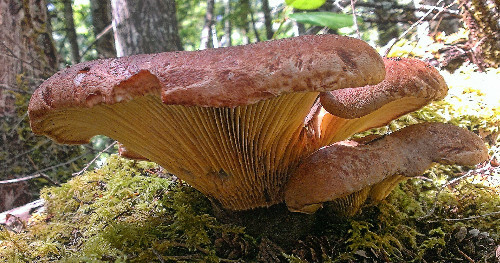 Thanks to an abundance of spring rains, we’re seeing mushrooms a few weeks earlier than usual this year—we can only hope this bodes well for an exceptional season later in the year! This gorgeous Tapinella atrotomentosa caught me quite by surprise a few weeks ago. The slugs had already nibbled on it a bit, so I cut off the largest cap, then tucked ferns and the spiky leaves of Oregon grape around the remaining little ones to give them a chance to grow. I took my treasure home, cut it into slices, and put it on the sunny deck to dry. My dearest used the oven that evening when making dinner (he cooks all our meals, which pleases me no end), so I popped the tray of almost-dry mushrooms into the still-warm oven after dinner. Much to my dismay, my little strips of Velvet Pax looked over-dark the next morning; not exactly burned, but darker than I’d expected. What had I done? I usually don’t find enough of these to treat them so recklessly and callously! 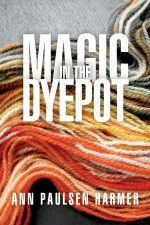 There was nothing for it but to put the sorry little bits in a test dyepot with a few strands of mordanted yarn, to gauge the damage. Clearly I need to get back into the routine—I’d used a little glass pot, and even though I’d set the heat on medium-low, I turned my back for what seemed just a minute, only to turn back and find my little pot almost boiling over. I was sure I’d screwed it up completely. 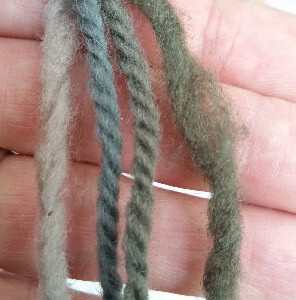 But look what came out of the pot (from left to right: no mordant, alum, iron, copper)—does that not look blue to you? The dye liquid, although a small amount, was still quite dark, so I popped in another test bundle and watched it this time, careful not to let it get over-hot. And this time the colours were more like what I would expect from a Tapinella pot allowed to overheat. I hesitate to try and repeat these results on a larger scale, but if I find a good number of Tapinella this year, I may just have to. It’s (past) time: crochet project starts now! 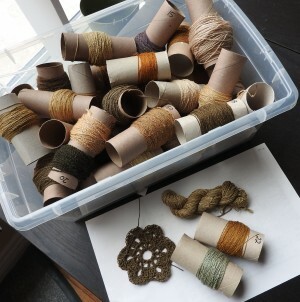 Some time ago—almost three years ago, in fact—I posted about my plans to knit a silk wrap. 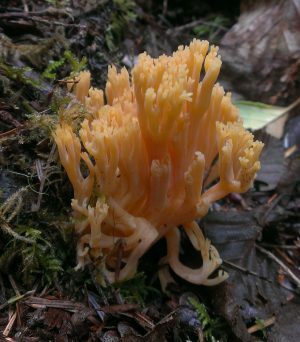 I didn’t mention at the time that I have an immovable deadline for this project: the Fungi & Fibre Symposium to be held here in Pender Harbour in October of this year. At this fabulous event, participants wait until the final gala dinner on the last evening to show off their new mushroom-dyed finery—lovely garments, clever hats, lustrous silk ties—items to be admired and marveled at for the rest of the evening. 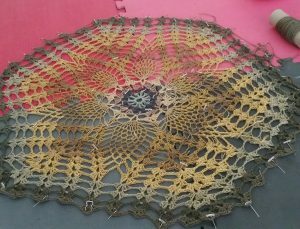 So I convinced myself that I could make a crocheted silk wrap, the construction of which is far beyond anything I’ve ever managed before; the same can be said for the yardage requirements (2,000+ yards of finely spun silk). 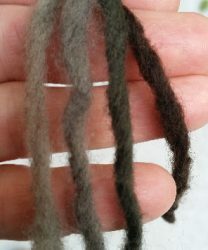 I don’t think I’ve spun quite enough yet, but the project can wait no longer. I must get started if I’m to complete it by October 22. The swatch is still a bit heavy, so I may have to move to a larger crochet hook, but at least I know I can make sense of the pattern. I’ll report as the wrap takes shape. Wish me luck.